The Rowing and Canoeing Centre is located near the Alange dam, and tries to be as neutral as possible with the environment. 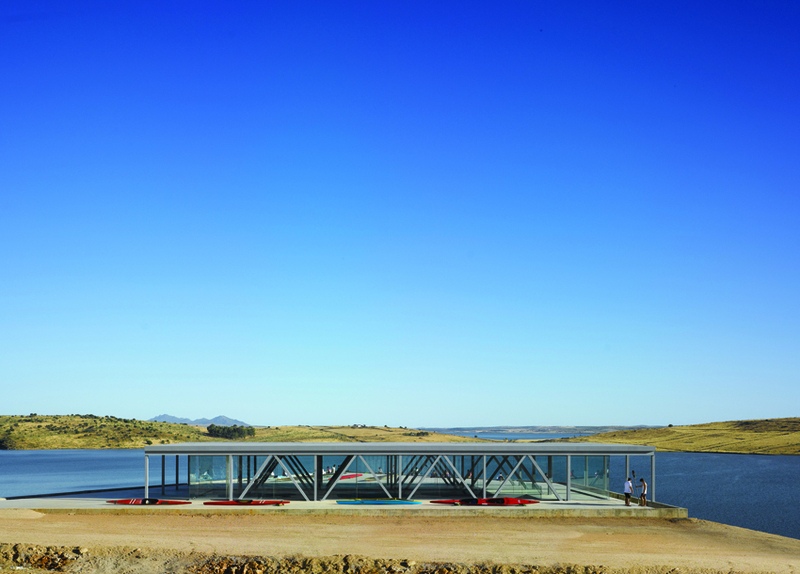 It is configured by a large pedestal and a light deck, creating between them a platform that dialogues with the landscape, looking over the water, the shore, the boats. It’s like a big veranda, a balcony, which focuses on the movements toward the water, with paths that are created to “look” and to “stay”. 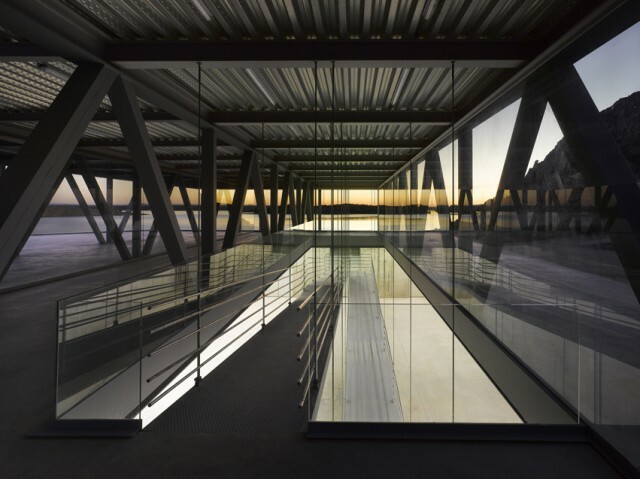 Over the platform, light metal trusses that spans over a large room of 21mx21m are constructed, holding the ramp that hangs from them. These trusses are covered to create a shady area. The lower level emerges as a raised platform, like a rock in which deep holes are drilled to introduce air and light, and that holds the more private needs of the program. The geometry of the building comes from the shape of the site and consists of a central hall that acts as a large classroom / workshop, and, around this area, located in the perimeter bands, are the public toilets and changing rooms for athletes, the residence area and the offices. 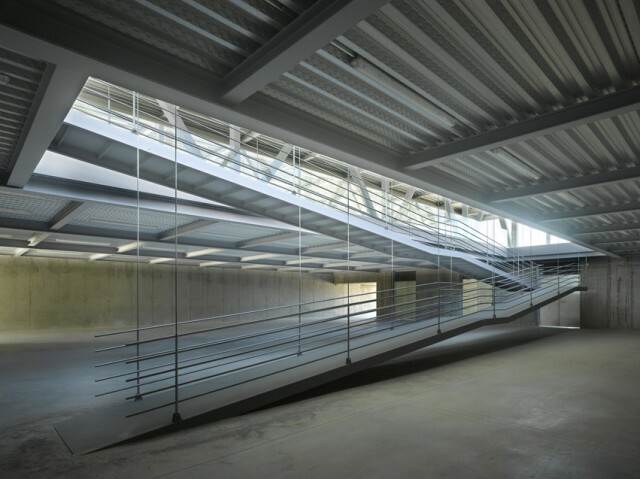 The relationship between the platform and the basing is solved with a large-sized hole, a crack in the platform that acts as a crevice that allows the passage of light into the lower floor, and holds a slender two-section ramp that hangs with wires from the trusses, and that connects the lower floor with the platform, acquiring therefore a very important role in the project. The section of the building allows two distinct entrances, the main to level 295, mostly used by spectators and the general public, and the ground level, used by athletes and technicians. The center helps to create the right environment, is as respectful as possible with the place, preventing visual and physical barriers and integrating itself within an environment of great value, being as neutral as possible. 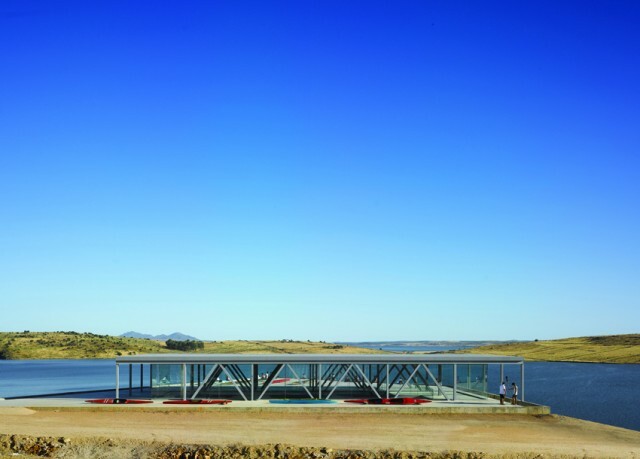 It is configured as a vantage lookout, with no change in the topography, communicating and linking visually the interior and the exterior of the project. On the other hand, the choice of the materials, presented honestly and without coating, makes the building integrated seamlessly into the environment of the surroundings of the village town, as a delicate industrial piece that reveals the activity that takes places inside. 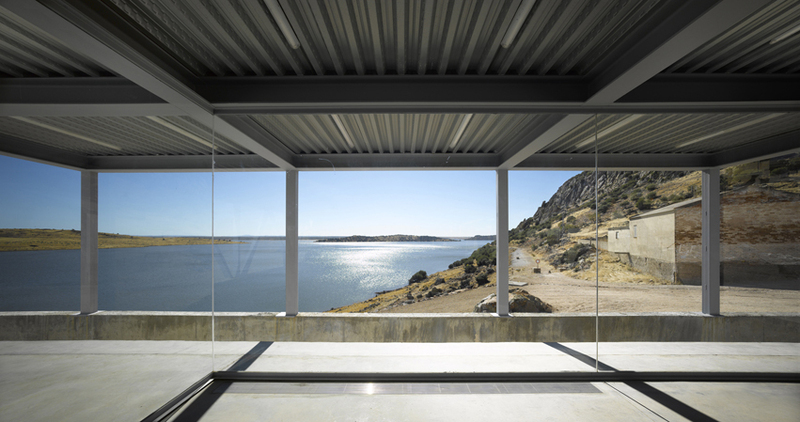 Its proportion, composition and permeability avoid the creation of a visual barrier for those who want to contemplate the water reservoir and all the surrounding landscape. The site which the Rowing and Canoeing Centre is located is implanted on the limit between the urban and the protected area of the shore. The site has a trapezoidal shape, with a total area of 1650.00 m2. The geometry of the building takes advantage of this particular form, fully occupying the ground floor. The site a slope of approximately 2.50 meters in the transverse direction to the access road. This gap is used in the project to define two distinct entrances and two floors with different character. The general layout of the building allows the relationship with the environment both near and far. In the upper floor, the large balcony presents a 360 º broad view of the landscape. In the lower floor, the holes frame pieces of landscape, showing the particularities of a specific orientation. The building has an access at an altitude of 295 m., which is the level at which the terrace balcony and street level meet in the northern fachade, so the access from the village is done naturally. To the south, the slope increases and the access occurs at level of 291.40m, leaving the elevated terrace as a ship’s prow that stands over the water. Between the level of 295 and 291.40 the hanging ramp connects both floors. The building is integrated into the environment so that its volume becomes part of the landscape. Due to the transparency of the cover, in which only the structure is perceived, and the shadow coverage that it provides, the concept of access floor disappears and we understand this space as a large shaded veranda where there are no obstacles to contemplate the landscape. The Rowing and Canoeing Centre of Alange is equipped with special facilities to provide specialized service to athletes who practice these sports. This building is intended to act as an enhancer of rowing and canoeing sports, as it has a nearby race area (9 blocks), a pier and a parking area. Among the facilities there are the reception area open to the large terrace, which in the future will hold the rest, meeting and study, areas, and the lower floor, with the residential area, the large multipurpose classroom / workshop space, the canoe storage and changing rooms, gym and all the dependencies for judges in times of competition. 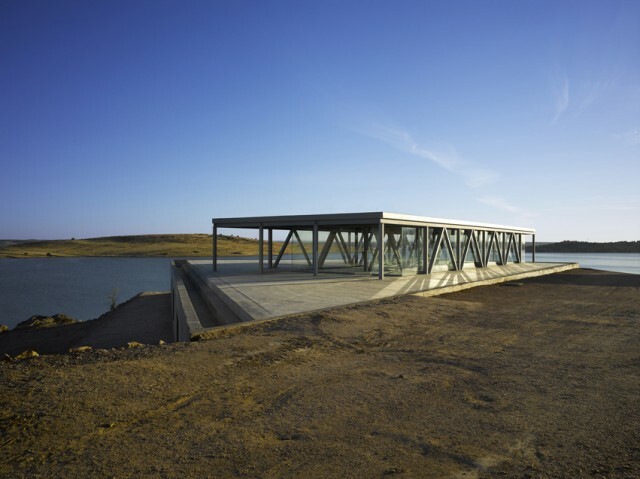 The Center acts as a meeting point for the elite athletes who practice different disciplines in relation to the navigable water so close to the project. Most center applications are developed on the ground floor. In this floor, the whole program is distributed around a large central open space, the workshop/classroom. Different secondary programs are configured facing the exterior landscape. The spaces related to the water have their own access from the outside to make an independent use; the canoes storage room, the gym and the multipurpose space. The latter has access to the locker room and to the residence for athletes. This versatile space is related to the outside with two large holes that place the user facing the landscape. The operation is completed with the topographic suitability of the surroundings to enter the water, and the location of a store area next to the water, that is used to hold temporarily the most widely used material. The Rowing and Canoeing Centre was built as two structures that complement each other. The ground floor was built as a powerful base, containing within its borders the more private uses. 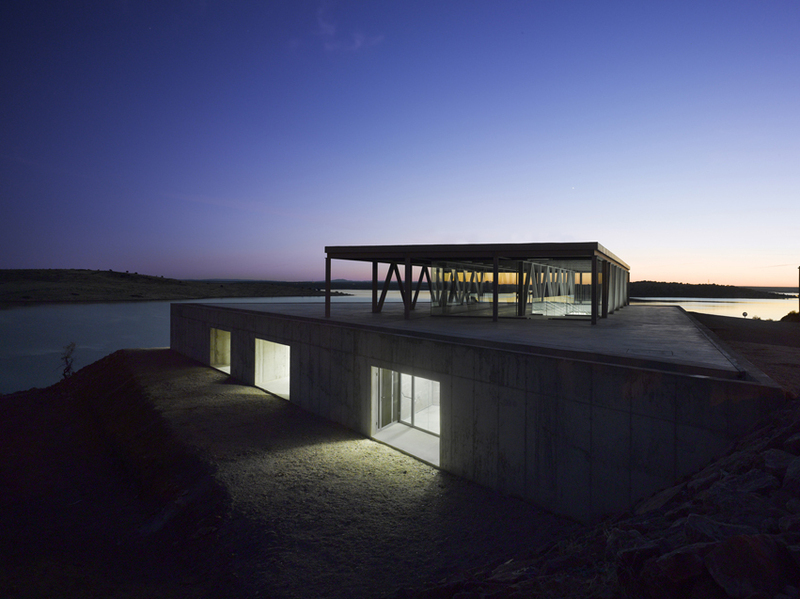 It is built entirely of reinforced concrete. Built limits leave a large open space. To cover this space, trusses are constructed of metal with a height of 3.20 m. The truss structure has therefore a double function, save the span of 21m of open space on ground floor, and holds the roof structure of the access floor. 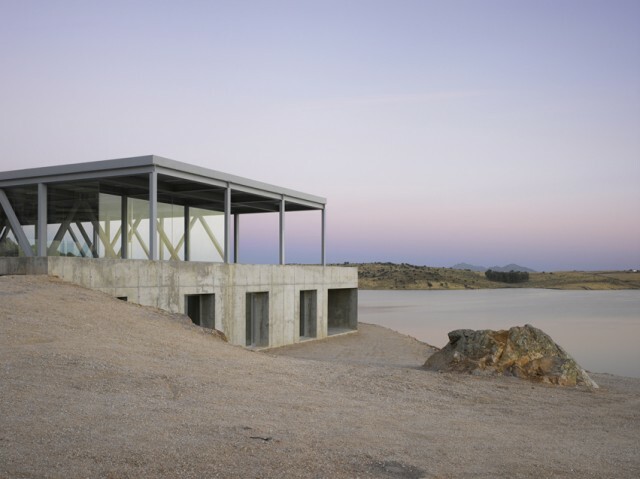 Structure: The structure is made of reinforced concrete walls and steel trusses of 3.2 m in height. The trusses are built with open sections of HEB type, top and bottom, and double diagonals formed by UPN, to form tubes to solve the diagonals and uprights. The floors are concrete slab on the edge of the basement and slab decking in the area of the trusses. The foundation is projected by mass concrete wells that sunk into the rocky slate (natural terrain) from 1.0 to 5.0 m. deep. The concrete is always seen, so there has been a special attention to surface finishing. Facades: the facades are the structural concrete walls in the basement with deep cavities sealed with glass, and large panes of glass with upper and lower profiles in the entrance floor, leaving sight of the truss structure. Covers: Covers are resolved in two distinct ways; the floor that makes the terrace and is part of the basement is a continuous plane of concrete. The light deck that is supported by the trusses is flat, and is composed of a steel decking and waterproofing lay of polyurea. The search for a platform without visual barriers on the terrace that has led to the creation of a perimeter edge as a step dug into the concrete base. This construction detail prevents the placement of a conventional balustrade at the edge of the basing are also a sitting area to watch the landscape around us.